(Player): ****** Is Kill Aura Hacking! (Player) He was hitting us and not even looking at us! Now before you say, Why didn't the mod ban him? Well the answer is, on this server mods can't ban -_- Pretty idiotic but that's how it is. After that I was damn righted annoyed. I was infuriated by this hacker and wanted him banned. Mostly everyone's initial reaction. This made me think, why do people do this? Do they find a joy in this? Or do they have no skill in PVP or Minecraft itself that they have to use hacks? Well the answer is all of the above. People need to consider others feelings, some actually love playing the game ( like me ) and don't want someone ruining it. Don't say I'm whining, I am stating the obvious. No one likes this. Mods and Admins do their absolute best to try and ban these guys but sometimes can't crack down on all of them. So help them by telling them or requesting for mod help. Together we can make Multiplayer the best experience yet! This is really a good blog on hacking, Hacking is something which is not at all fun. If you are an user of Google then you can directly visit https://googlesupport.co/ for the proper solution. It's some sad people who make hacked clients and then 8 year olds who think they are smart by killing people, which they find amusing somehow. Diamond anyway zach. Your awesome! I think someone rustled zachstar1998's jimmies. That's almost 100% Right Rova, except you missed something, It's nto about dieingor losing stuff, it's about ruining the experience for players. You may not enjoy the game as much as I do so you wouldn't see it as a big deal, but I do. Totally understand. People can just be such douchebags when it comes to other players who just want to have a good time. Yeah I know, it sometimes frustrates me. Hell, it's fun. Not the act of client using itself, but reactions like this are what makes it worthwhile. It's just a game... Don't cry about it. This may be "just a game" but most servers get donations so it isnt necessarily "just a game"
at a server i saw someone hacked instakill with kill aura... it was bukkit with SafeZone he killed even in there. O my house is griefed... YAY SPACE TO BUILD!!! Lets make a new bigger one thats 100 times cooler with enderchests! Agreed, your suggestion was what I did originally (rebuild). My base ended up so EPIC once it was over. 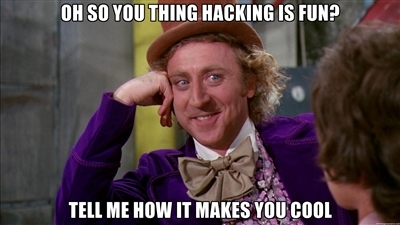 A hacker is someone who uses their skill to slap together a thing, to solve a problem (sometimes called a white-hatter). A Cracker is someone who uses their knowledge of technology to break into systems and do nasty things (sometime called a back-hatter). I dont do it myself but I can see how it's fun, I know it sounds odd but one of the most funniest things in gaming is trolling others. @OmegaMudkipz I agree with your agree! Yes it is funny to hack. But you need like you said consider others feelings. That's why i don't do it. Zach, you making fun of me? I hack sometimes for singleplayer. are you calling me a noob? I was once accused of "hacking" but I really didn't hack. I was playing Hunger Games in a server. I killed someone and then he said I wasn't even looking at him. But I was. I killed him while he was looking in a chest and he said he saw me not looking at him. I really didn't hack and maybe the guy or I lagged. But the admin (My best friend) luckily didn't ban me from my favorite server. But I really didn't hack nor do I know how to hack. "why do people do this? Do they find a joy in this? Or do they have no skill in PVP or Minecraft itself that they have to use hacks? Well the answer is all of the above." They're not hackers, and they don't have any skill. It's not hacking if you download some cheat programs and install them; that's "pathetic". If they had any skill they'd be creating them themselves, but they don't and can't. Troll is right, but I think it's quite reasonable to infer they have no skill. Or IQ points over 50. You have made no such point beyond the fact that you've used them yourself (which was pretty evident from your tone in your first post). Woah! I was there, I know what server, if not, I remember that happened to me today! What server? Gimme because I need to take that guy's heart and rip it off in real life. This is really freaky, and yeah.... LOL, still cant get over this. People do this because of the same reason they grief, because the can. If we have the ability to do something, somebody will do it. Why Can't We Post This? 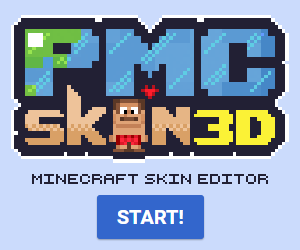 Want a Minecraft Parody Written for You? Ask Me!